Don’t you just love the holidays? And don’t you just love when they’re over? I adore all of the carb-heavy, fat-laden, coma-inducing foods I make around Christmas but when it’s over I am always left craving something that cuts through the heaviness of traditional holiday food. What I really wanted tonight was Hot and Sour Ramen but I didn’t think I could get away with it again so soon. Once again, though, I turned to my 30-minute lifesaver and found Vegetable Lo Mein. And boy is it good. You will probably find the fresh Chinese noodles in the produce section, near the other Asian ingredients like ginger, tofu and bean sprouts. 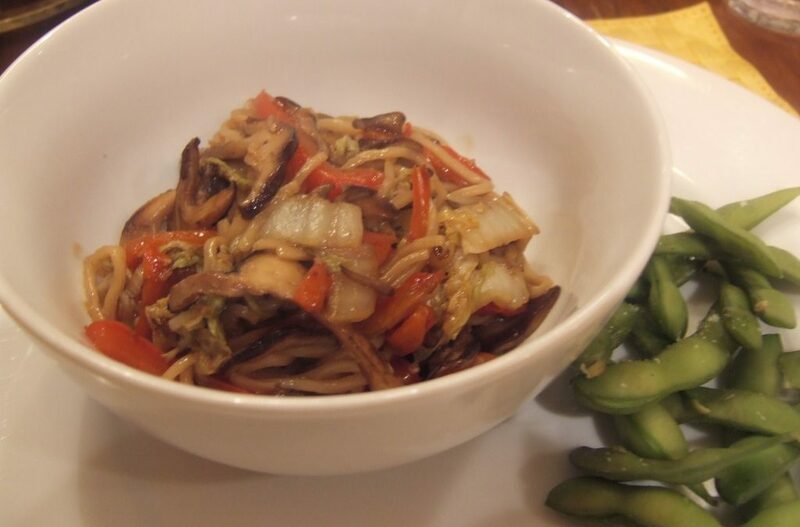 Everything else is pretty common — shiitakes, napa cabbage and red bell peppers — but it all comes together in a highly tasty and palate-cleansing quick dinner. There is also a variation using beef (which, in turn, can be substituted with pork or chicken).